Last night, I went to Michael’s to get craft supplies for a school project for my oldest son. And all was well until I looked at my phone to see it was 8:20 p.m. at night and there were still two more people in front of me in the checkout line. I then looked down at my baby in my arms yawning and began to feel guilty I had him out so late while simultaneously feeling like a failure for forgetting my son had a project due the next day. And that’s when I saw you walk in. You had two preschool-age children and you were so nonchalant about it. You weren’t holding their hands as they walked in next to you. Instead, you just trusted them to stay by your side in the store. Without even grabbing a cart for them to sit in, you just began looking around the first aisle in a leisurely fashion with no speedy intent or purpose. If anything, you seemed like you showed up just to shop, for the fun of it. At 8:20 p.m. at night. With two small children. And I didn’t understand how you could be so peaceful, so I just kept staring. I want to be more like her because she’s doing something right. So today, dear mom in Michael’s who doesn’t take herself too seriously, I commend you. And today I encourage other moms reading this to take note of what you did that night that I think we could all benefit from. Because I know that as moms living in 2017, we are riddled with parenting advice (often unsolicited) no matter which way we turn. And we need to recognize that if we don’t take a moment to stop and smell the roses (or, in your case, the cinnamon scented pinecones on leftover clearance from Christmas) we may be missing out on the things that matter most. 1. There is more than one way to be a good mom. It’s easy to feel that there is a specific formula to being a good mom. But sometimes being a good mom can look differently than expected. Good moms don’t all put their children to bed at 7:30 p.m. Good moms don’t always make their children ride in a shopping cart. And some good moms even let their child eat a candy bar at 8:30 at night when checking out. If we don’t believe these things can be true, we will never break free from the outside pressures we feel to strive to be something we’re not. That night as I watched that mom in Michael’s, I could tell that she was not concerned what anyone thought of her. She was doing what worked for herself and her children. As moms, we need to take note of this behavior and recognize that our family’s needs are not the same as our neighbors’ needs next door. Some kids can stay up late because they sleep in the next day and don’t have any engagements. Likewise, some moms need to put their kids to bed at 6:30 p.m. (and might get judged for that “crazy early” bedtime) because they wake them up at 5:30 a.m. to get them to daycare before work. You know what your family needs better than anyone else does. Embrace that and make decisions from that place of knowledge. 3. If we moms can’t find moments to stop and smell the cinnamon-scented pinecones, we are missing the point. Have you ever noticed there are days where you are so caught up in running from one thing to the next that you don’t feel like you are finding time to enjoy your children? For example, if I had stopped putting pressure on myself that night in the store, I may have been in a better mindset to enjoy doing the project-planning with my son. But because I was focused on why I should have done something differently, I couldn’t enjoy myself in the present moment. And that’s sad. 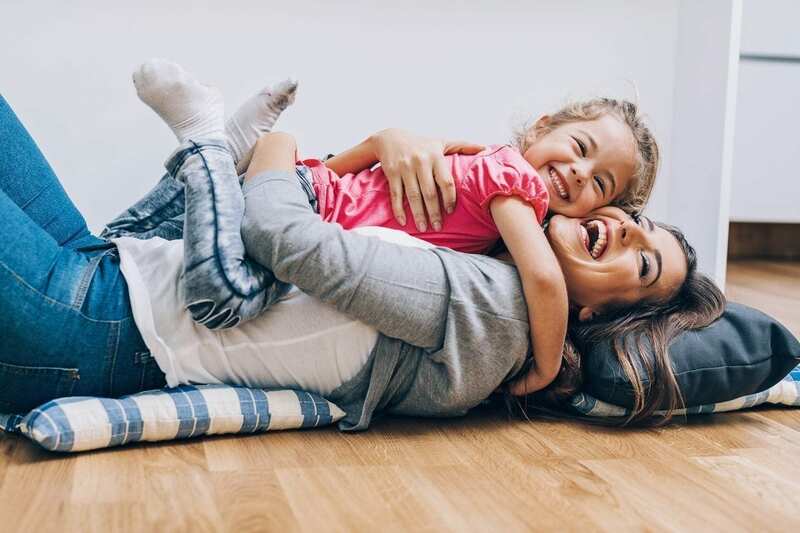 As moms, we have to break free from letting stress or unrecognized pressure to be perfect stop us from enjoying the little moments in front of us. Because, as they say, life is not made up of the big moments, but the little moments strung together. 4. Give up the notion that perfection in motherhood is a reality. If we continue to believe that we really are capable of making all organic meals and having perfectly behaved kids who sleep 14 hours a night and read at age 2 . . . we will live a slow and miserable mom life when we realize accomplishing all of these things is just not attainable. And never will be. We all say we know we can’t be perfect, but so much of the time, we make decision as though we are striving for it. That night in the store, that mom did not seem to care if she looked like the picture of perfection. But she looked SO happy. And what an impact that made on me. So much so, I am writing about it, months after the fact. So for all the moms who have broken the cage of feeling like every little detail has to be perfect and planned, who let their kids crawl across the floor at Chick-fil-A, who let their kid’s Valentine box look like a piece of tornado debris. And to the moms that let their children walk into school with kinks in their hair because they fixed it themselves, I raise my tiny metaphorical sippy cup to you! May we all strive to have at least a few moments a day where we don’t take ourselves too seriously.